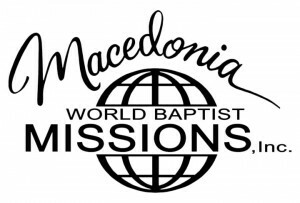 We are affiliated with Macedonia World Baptist Missions, an Independent Baptist Mission Board headquartered in Braselton, Georgia, near Atlanta. Being part of the Macedonia family provides us with logistical structure and support, encouragement, accountability, and most importantly, a worldwide network of likeminded prayer warriors around the world. Under the leadership of the late Dr. Thurman Wade, and now led by Dr. Scott Caudill, Macedonia has been an incredible blessing and help to our family on deputation and on the mission field.